She's Sew Crafty: Crafty Catz July GDT!! I am so happy to announce that I am a guest designer for Crafty Catz this month! Their new challenge this week is Child's Play! The sponsor is Redonkadoodles and I had the pleasure of working with the Karate Kick Boy image. 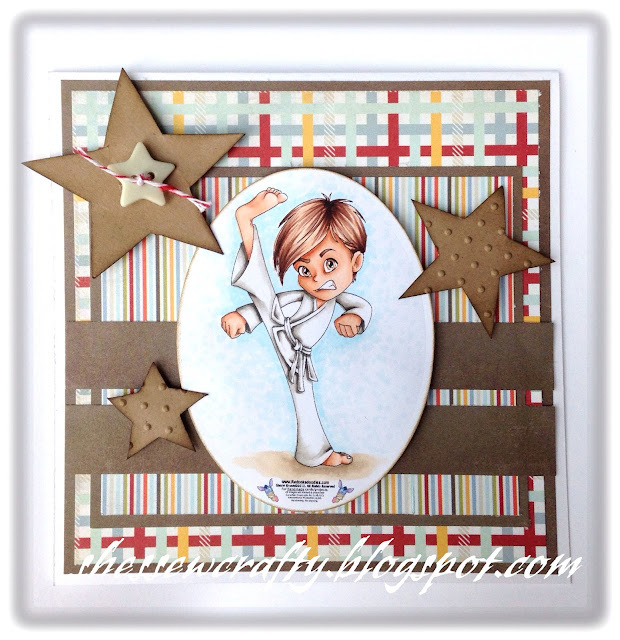 It was so perfect as all three of my boys love karate! I hop you all like my boy card and please check out the Crafty Catz blog for more inspiration for their Child's Play challenge! fabulous card Danielle and stunning colouring. great to have you with us for the month! Dear Danielle, I still can't believe you can color like this, this is absolutely... WOW! I am so glad you joined us this month as a GDT at Crafty Catz! The coloring here, Danielle, is really super professional! That is one gorgeous boy card!!! I really love the great layout and fabulous dp you have used. Your coloring is stunning. Just gorgeous. Wonderful masculine card. Love your layout , your image is amazing, love how you colored him and love your papers. Thanks so much for joining us at Cards for Men, we love seeing your creation. Good luck on the challenge. great boy card and coloring. I am very glad you entered this week at Tuesday Throwdown. I hope you had fun!!! See you back very soon to play in another fun challenge. Very fun card! Love your coloring! Thanks for joining the challenge as Wags n Whiskers! Well hello Danielle....wonderful creation for your GDT spot with us at CRAFTY CATZ, hope you have a fun time with us! While i'm here i will pop my DT head on for TPC thanks for sharing your creation with us. Wow love your card- the colouring is amazing- thanks for joining in at Sweet Pea Stampers this week. Your card is fabulous. So perfect! Thanks for playing with "Sweet Pea Stampers". Good luck! So cute! Love this image and it's so much fun! Thanks for joining us at Tuesday Throwdown and I hope you'll play again real soon! Fabulous card Danielle. I love the coloured paper and cute image. OH my gosh...so cute! Thanks for joining us at 4 Crafty Chicks this week for our "dry embossing" challenge!